Visualize your team's metrics all in one place. Team Dashboard lets you visualize your team's metrics all in one place. It is build to be shown on a big screen in your team's space. It has built-in support for Graphite, Ganglia, Jenkins, Travis CI, Errbit, New Relic, Pingdom and more and makes it really easy to add more data sources. 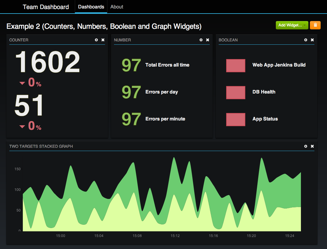 It is implemented as a Rails app and uses ActiveRecord to store your custom dashboards configuration. The final release is now available. More details in the announcement. Lots of new features and bugfixes. This is (hopefully) the last release candidate! Please checkout the release announcement and read the Migration Guide. System-wide configuration settings are done in either application.rb or with an environment variable. All data sources reside in app/models/sources and provide source code documentation with further details. 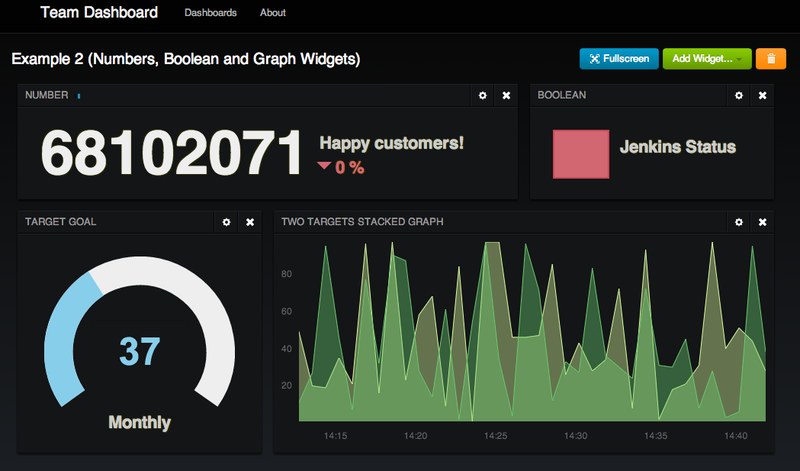 A dashboard in Team Dashboard consists of multiple Widgets, which request data from a data source via AJAX request. All widgets have a name, time interval in which to update themselves and a data source as a common configuration. You can easily add your own data source plugins (Data Source Plugins Developer Guide) and implement custom widgets (Widget Developer Guide). The graph widget shows a time series line or area graph. Use it to show number of visits on your web page or number of currently online users and follow-up on trends. It currently supports Graphite and Ganglia. Shows the current integer value provided by the data source, the percentage of change compared to the previous value and an optional label. Use it to show for the example the number of errors on specific systems or the number of users. It currently supports a New Relic, Hockey App and a http proxy data source. Shows the current boolean value provided by the data source and an optional label. Use it to show for example the success of a Jenkins build or the health status of a system. It currently supports Pingdom, arbitrary shell commands and a http proxy data source. Shows the current build status for a given project. It currently supports Jenkins and Travis CI. Shows the number of unresolved errors in your exception tracker, and when the last error occurred. It currently supports Errbit. Thanks go to Martin Tschischauskas and Marno Krahmer who worked with me on the first iteration which was build as part of a XING Hackathon Project.